What is BAYADA Supportive Care? BAYADA Supportive Care is a patient and family-centered medical model, made possible through a demonstration project by the Centers for Medicare and Medicaid Services. 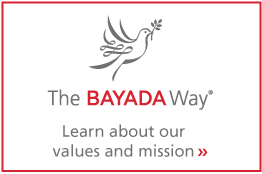 BAYADA Supportive Care enables individuals living with a serious or advanced illness to access many of the benefits of hospice without stopping curative therapies. How can supportive care services from BAYADA Home Health Care help? We listen to patients’ concerns and desires and collaborate with them, their providers, and families to develop a plan that empowers them to live as well as possible while facing a serious illness. We provide information and services needed to ensure that the patient directs their treatment to the maximum extent possible and is enabled to make informed choices and decisions. What services are included as part of the BAYADA Supportive Care offering? BAYADA takes an interdisciplinary approach to delivering medical, nursing, social, psychological, emotional, and spiritual services to meet the many physical and emotional demands of a serious illness. Who is eligible to receive supportive care services? How does BAYADA work with other care providers? The role of the BAYADA Supportive Care team is to partner with you and your patients’ other health care professionals to provide an additional layer of support while your patients navigate their options in the face of a serious illness. Our responsibility is to ensure that the care delivered is reflective of the wishes of the patient and family. Under this program, the patient retains their Medicare Part A, B, and/or D benefit and providers continue to bill for their services as they normally would. The only difference is that patients can receive BAYADA Supportive Care services concurrently with the care they are receiving from their other providers, thereby enhancing their overall health care experience. Why should I recommend BAYADA? For nearly 40 years, BAYADA Home Health Care has been a trusted provider of in-home care including nursing, therapy, rehabilitation, and assistive care services. Our care professionals receive ongoing training and supervision, and employ evidence-based protocols to ensure our care meets the highest clinical and safety standards. We deliver all home health care services with compassion, excellence, and reliability. That’s The BAYADA Way. How do I refer a patient to BAYADA for supportive care services? To make a referral or for more information, call BAYADA anytime, 24 hours a day, 7 days a week at 800-555-4321. We’re happy to answer any questions you may have.